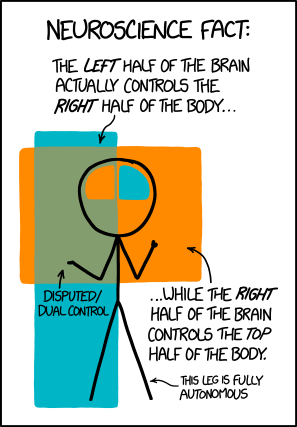 Title text: Neurologically speaking, the LEFT hand is actually the one at the end of the RIGHT arm. This is why playing drums is so difficult. LaserGuy wrote: Or some future Democratic president declaring global warming a national emergency, say. gd1 wrote: Russia to pull plug on nuclear arms pact after US does same. Maybe I don't need to worry about Brexit after all. Zohar wrote: This is not new, his surveys are always terrible. Fake news. He has great surveys. The best surveys. In case the last panel has left you curious, there are some examples here. Did he pass up on the other seven (or more) opportunities to celebrate the same thing during 2018?